Asian Grocery and Spices at 1956 Jane St has received a conditional pass from DineSafe. The grocery store did not provide washroom supplies and did not use a thermometer to keep customers’ food at safe temperatures. Both of these are significant infractions. The store also did not meet the washroom requirements, which is a minor infraction. Four employees of Health Canada’s Radiation Protection Bureau were taking samples from Elm St Park today. 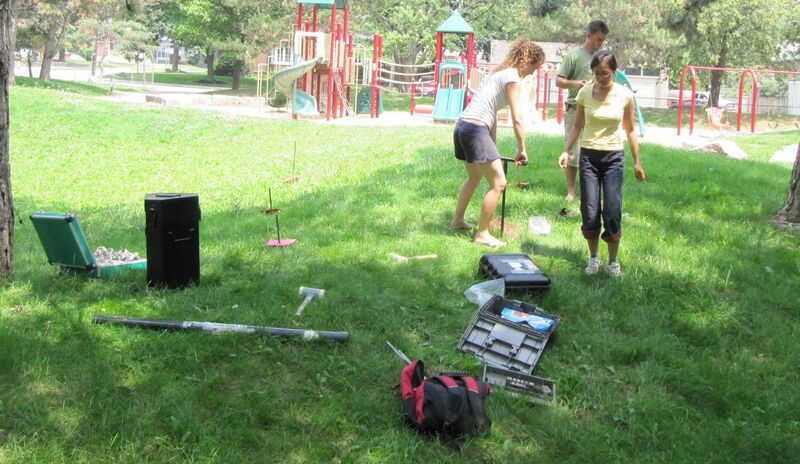 They are co-op students sent to study radon and radiation levels around the Toronto area. Ellen Leigh, also a Carleton student, said that they would be in the Toronto area for some time, taking samples from around the city. All the data are taken from parks, and at the end of the study, the Bureau “will publish it in a map”. Happily, while kids are free to pretend they are the Incredible Hulk, no real green mutants will be created in Weston. 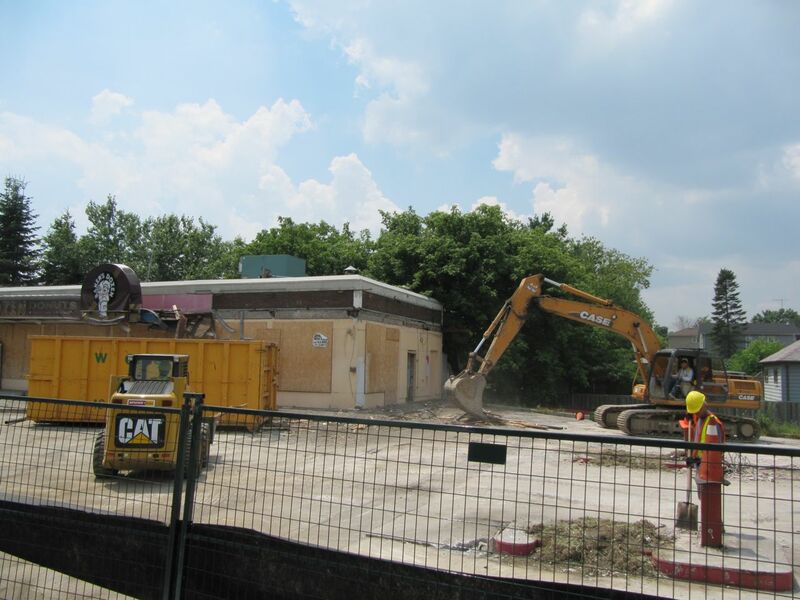 Work has started on the disused Baker’s Dozen donut shop at the 401 and Weston Rd. 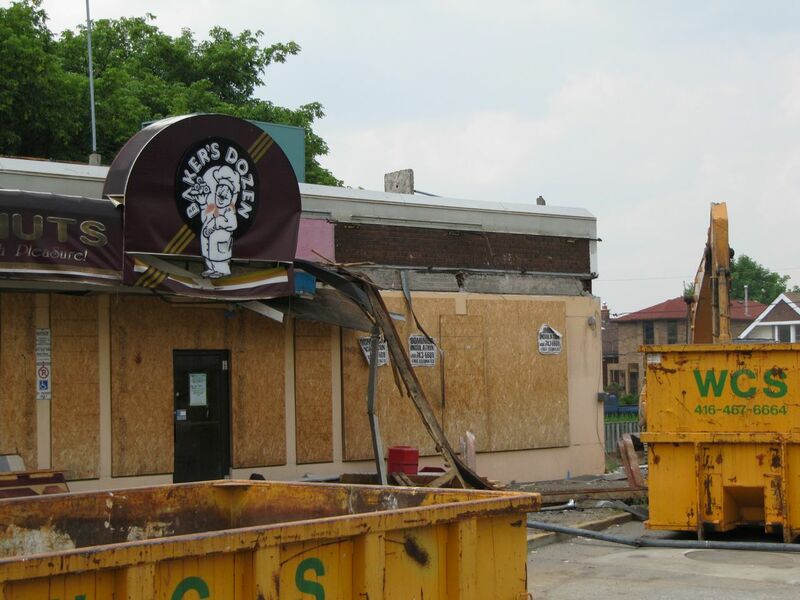 The donut shop appears to have suffered a fire many years ago, but it was left closed, unrepaired, and in terrible condition. It was a noticeable eyesore on a major entryway to Weston. Until recently, the Beaver gas station on the site continued to operate. Currently, three men with heavy equipment are demolishing the existing buildings. According to Laura Albanese, the MPP for Weston, the site will be turned into a Shell gas station. Laura Albanese has signed the Clean Train Coalition’s pledge. GO will not use Tier 4 trains on the Georgetown line when it opens in 2015, according to InsideToronto. Instead GO will use much dirtier Tier 2 engines. GO Transit presented information about the line at two community meetings on June 23 and 24. In the story boards, GO says they will use Tier 4 engines, which vastly reduce particulate and nitrous oxide emissions, when the new engines are “commercially available”. They anticipate that will be in 2017. The line is due to open in 2015, however. Tier 2 trains would therefore be in use for two years if everything goes according to plan. UrbanArts is looking for local artists who would like to be featured in their annual CultureShock Community Arts Festival. The festival is August 14th from 1–7 pm at Weston Collegiate Institute. Auditions will be held on July 15 from 4–6 pm at UrbanArts on John St. Visual artists can submit their work directly by email.